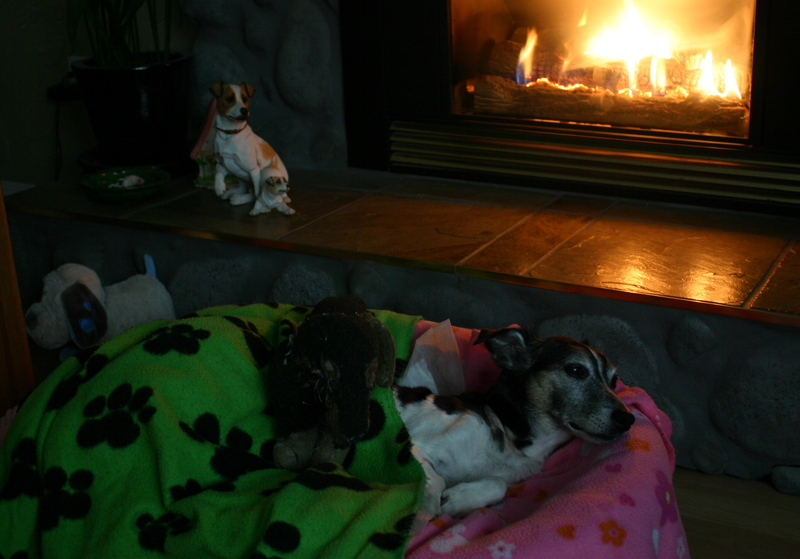 Maggie with her favourite stuffie that still squeaked and her green blankie, snoozing by her favourite spot by the fire. Her last night. Time ….. the days go so fast, the years even faster. It’s been 4 years now, but I remember that day like it was yesterday. I remember how I felt, how the tears ran down my cheeks as I held Maggie in my arms one last time and said goodbye. I told her how much I loved her, that it was ok to let go. I could not imagine not being there with her as she crossed to the other side, she was with those that loved her. Her battle was over, and I knew she was at peace. How on earth was I ever going to get through that unbelievable grief I was feeling, how could I keep her with me forever. 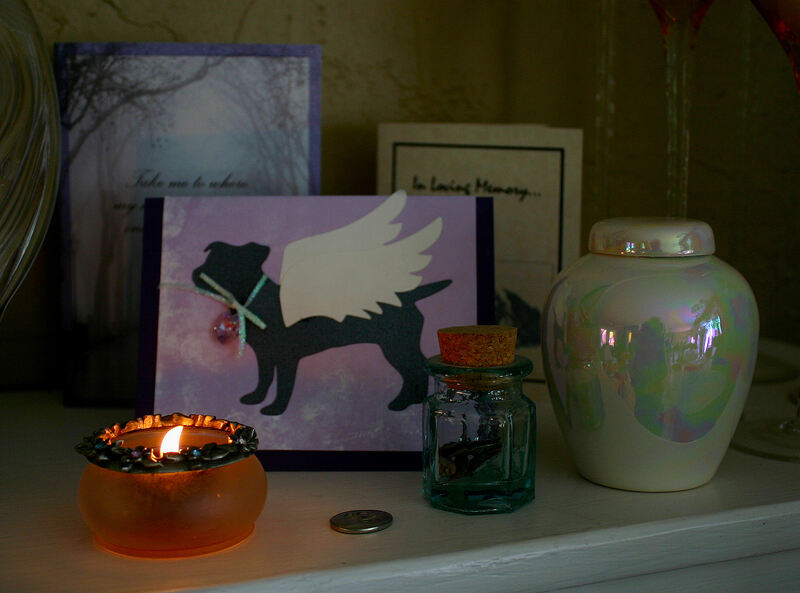 I felt she was home once her ashes sat on our mantle, but my heart still ached. I started to sew, with my Mom, we sewed quilted blankets in Maggie’s name, for the hospital, to comfort the pets there, to show our appreciation to the staff at Boundary Bay for their compassion and kindness. I wanted to give support and encouragement to other pets battling cancer, so we made them bandana’s with Maggie’s name. We donated blankets to the SPCA, and many rescue dogs. It helped. We struggled though, for many months, telling ourselves that we would never go through such heartbreak again, but then Jackie came into our lives. By chance, I saw her photo, there was something in that mischievous smile of hers that told me she belonged with us. Just maybe, Maggie did send her our way, telling us …. it’s time to move on, give another a second chance. Jackie now shares my heart, and is our Supervisor, in more ways than one! I decided I wanted to do more, to make a difference in the world, and I wanted to do it in Maggie’s name. It was my way of managing my grief and keeping her with me. In Memory of Maggie May was launched 1 year later, and here we are, reaching our 3rd Anniversary and having donated $15,600 to pets in need. Unexpected medical care for our pets is expensive, some of us are able to find a way to bear these costs. But, imagine for a moment the heartbreak for those that cannot. Although we are considered a small organization, with your support, we have made a big difference to those lives we have helped. I am thankful to many along the way, my Mom, my husband, Elizabeth, Sharon, Donna, Peggy, Dr. Walton, all our supporters, and to Dr. Maja for believing in me and my dream 3 years ago, and who helped launch us on our way. I am especially grateful for the special friendships I have made through In Memory of Maggie May, they have supported me, provided encouragement, guidance and comfort. I love sharing our journey and our memories on Maggie’s facebook page, where you will also see posts that we feel a connection to, posts that make us laugh or smile, feel sorrow or anger, and even learn from. I appreciate and thank you all for the comments, likes & shares. I will be honest though, it is a tough job at times, it can be frustrating, disappointing and saddening, but in the end it is always rewarding! I take a deep breath and remember why! In Memory of Maggie May has given me purpose, I will honour my commitment to her forever. It is amazing how this little girl changed my life. Maggie’s mantle, her candle is lit everyday. They say time heals, and it does, but it doesn’t mean you ever forget those you loved and lost. My eyes still swell each time I think of her or speak of her. She will always be family and her memory will live on, in a very special way. No matter what your grief is, it is ok! There is a way to break through, in your time, you will find your special way! Whether you support our organization or another is not what matters, what matters is that you do, whether it be big or small, by helping others and animals in this cynical world, you get a great big thanks from me! I thank everyone for their belief in us, and making “In Memory Of Maggie May” a reality.